With each new book published by Greg Leitich Smith I am more impressed with his writing. This book was a great fun story. It was humorous, entertaining and a little silly, but that being said it is a book kids will love. Greg is the author of the Chronal Engine and also the two books set at the Preshtigo School in Chicago: Ninja, Piranhas, and Galileo and Tofu and T. Rex. This book set in Cocoa Beach in South Florida is a mash up of Beach culture, UFO enthusiast, and Space Flight fanatics around the Cape. Aiden lives and works at his parent’s hotel on the Space Coast, the Mercury Inn. His best friend Louis also works at the hotel and is definitely a UFO enthusiast, who swears he saw a UFO two years ago during the accident in which he lost his leg. The Mercury Inn is known for throwing huge parties during any space launches. And Aiden and Louis have seen a lot of weird stuff working at the hotel but things have just got a whole lot weirder. An actual UFO appears during a scheduled space launch and caused life for all at the inn to get even crazier. 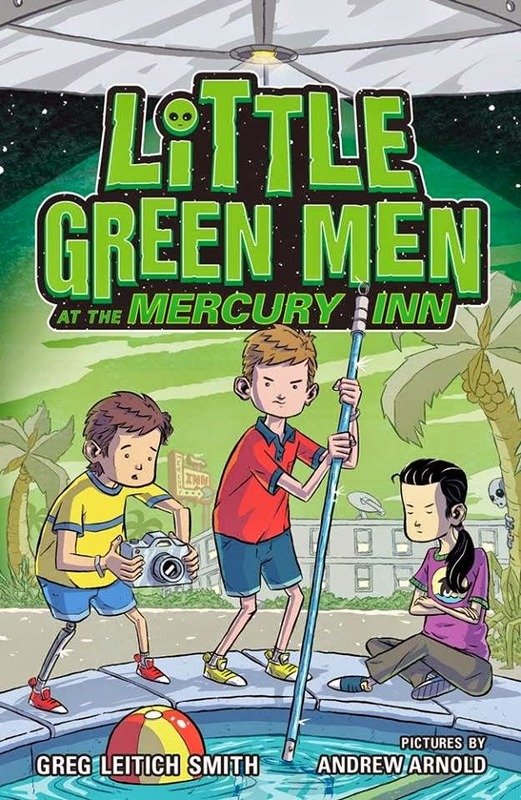 What young reader would not enjoy a story with aliens, UFO’s, government cover-up’s, weird scientists, exuberant media personalities, and a couple of guys just trying to figure out the lengths that friendships can go, especially if one of the new friends ends up being a little less than human. This book is a great entertaining read, humorous, quirky and full of surprises. So give it a try and see where Greg will take your imagination!